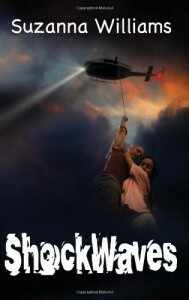 Shockwaves is a unique YA story that is filled with FUN action. There’s lots of tumbling and jumping, which kept my interest pumping. I loved the characters, they were easy to relate to, and they will be great together in the following sequels. The special friendship that Paige and Lee developed, through the trials in this story, will naturally lead them to more adventures. The young teenagers were everything we love to read about – energetic, optimistic, loyal, full of emotion, and best of all telepathic! I loved this story line – two teenagers, bound to each other via the mind! The trials kept punching and Lee kept tumbling using PARKOUR, how unique. I am looking forward to more in this YA series by Suzanna Williams.